Longleat House and Safari Park can be found near the town of Warminster. It is the home of Alexander Thynn, the 7th Marquess of Bath. With 900 acres of ‘Capability’ Brown landscaped parkland, a safari park, maze, animal shows and regular events, there’s plenty to see and do. The beautiful stately home is widely regarded as one of the best examples of high Elizabethan architecture in Britain. Built by Sir John Thynne, it is full of priceless antiques , ornate painted ceilings and one of the largest private book collections in Europe (over 40,000 books). Free flow tours are possible during the main tourist season. Some of the highlights of the house are The Elizabethan Great Hall (with a minstrels’ gallery), visitor books showing royal signatures, The ante-library and The Breakfast Room with magnificent Venetian paintings on the ceiling, The State Dining Room with a Meissen porcelain table centrepiece, The State Drawing Room (designed by Crace) and The Grand Staircase. 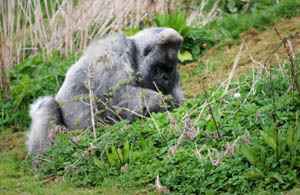 Today there are over 500 animals in the park from lions, wolves and cheetah’s to camels and mischievous monkeys. 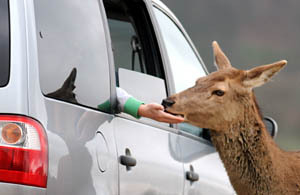 The safari park was opened in 1966 and was the first drive-through safari park outside of Africa. There’s a one way system in operation and a double gate system keeps the animals in the correct enclosure. Beware of the monkeys though – they frequently pull off rubber trim and damage cars, but they can be avoided if desired. There are self drive and guided options. The Jungle Cruise is a short boat ride on the park’s lake which is home to a large family of sea lions, a pair of hippos and a silverback gorilla called Nico who lives on the central island and is partial to watching TV and drinking hot Ribena. A cup of fish pieces can be bought on board to feed the seemingly ever-hungry sea lions that follow the boat, diving, barking and begging for more fish. The Jungle Kingdom opened in 2011 and includes walk-through exhibits for meerkats and chipmunks and enclosures for otters, binturong, coatis, porcupines, giant anteaters and mara. Nearby is the Monkey Temple with tiny marmosets running free around the visitors. In the Animal Adventure section there are many exotic and familiar mammals, birds, reptiles and insects on display, including Macaws, Rabbits, Tortoises, Iguanas, Armadillos and Siberian Weasels. 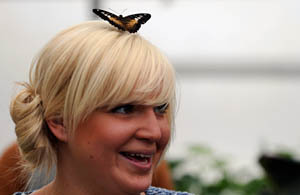 If you like getting really close to the animals you can feed the deer and giraffes, give the noisy Rainbow Lorikeets a nectar drink as they perch all over you and walk amongst beautiful butterflies in the hot house. There are also opportunities to hold snakes, spiders and rodents, supervised by rangers. The Hawk Conservancy Trust put on a spectacular 30-minute Hunters of the Sky show featuring more than 10 species of birds of prey in a purpose-built 500-seater outdoor arena. The extraordinary aerial prowess of the birds is demonstrated as you experience the thrill of a vulture’s wings swoop close to your head, and marvel as the majestic eagle taking flight. As well as being entertaining, the show is also educational. Getting lost is pretty much guaranteed in this high hedged maze. It has 1¾ miles of paths edged with over 16,000 English Yews, with 6 bridges to give tantalising glimpses of the observation tower that is the target.